In rural Shaanxi in the 1950s, gender was everywhere an important axis of difference, and it remained so even as the content of normative gendered behavior shifted. Yet gender itself was entangled with specificities of locale and with generational differences. Other themes, too, crosscut and sometimes confound the neat sorting of women into specified roles and orderly progress through time. This chapter frames many of the stories that follow with attention to four of those themes: the importance of place, the limitations of the archive, the particularities of the listeners and speakers, and the gendered qualities of memory. Place: "All Socialism Is Local"
In each of the places we interviewed, we aimed to understand the specific meanings of socialism, particularly for women who remembered the period before 1949 but whose adult lives were lived largely in the collective era. Local variations in size, gender ratios, crops, community norms, leadership, and accessibility (see Table 1) served as a constant reminder that the very term "China" is a convenient shorthand, a way of organizing our teaching, writing, and understanding of history and contemporary politics. In the long 1950s these villages were governed by a Party-state in the midst of a powerful drive to make "China" uniform, to produce in every village the presence of a state, even while institutionalizing differences between urban and rural life. This state was powerful in part because it managed to reach into rural areas, chiefly by involving local people rather than proclaiming from on high. But as the late Speaker of the U.S. House of Representatives Tip O'Neill once famously said, "All politics is local," and here our persistent habit of talking about "China" obscures the extent to which all socialism is local. Even the most prescriptive edicts of a centralized state must be implemented in widely varied environments, by local personnel who interpret, rework, emphasize, and deflect according to particular circumstances. The working out of state policies was everywhere contingent upon geography, prior social arrangements, and local personalities. In Weinan County's Village B, for instance, located a few kilometers south of the Wei River in the cotton-growing plains of Guanzhong (see Map 2), houses are close together and neighbors know about goings-on in the next courtyard. By contrast, in Village T, in Nanzheng County, a rice- and tea-producing district in Shaannan not far from the Sichuan border, houses are spread among the paddy fields and mountain paths. In Guanzhong, where Village B is located, people used to say that women in Shaannan, where Village T is located, were sexually loose, scattered as they were where neighbors couldn't keep an eye on them. In Village Z, in southeast Shaanxi's Danfeng County, near the Henan border, families who live on the main street of the market town once looked down on those who lived in the mountains (calling them "poor and backward"), and those who lived in the mountains looked down on those in the town (calling them "sleazy merchants, not honest farmers"). Situated where the Dan and Yinhua Rivers converge at the eastern edge of Shaannan, Village Z has long been a trading center for mountain products such as tong oil, walnuts, chestnuts, and medicinal plants. In Heyang County's Village G, at the northern edge of Guanzhong hard by the Yellow River, which divides east Shaanxi from neighboring Shanxi Province, deep gorges in the friable yellow earth score the landscape. Here the cultivation of cotton, the local practice of weaving, the ubiquity of local opera, and the persistent lack of water have all shaped household economies and modes of sociality. One additional group of interviewees was linked by organization rather than location: Women's Federation cadres who had been sent to work with village women in the 1950s. Now retired, they retain a keen sense of the importance of raising women's status, a goal formally espoused by all state agencies but pursued most passionately and consistently in Shaanxi by the Women's Federation. Unlike most of the village women we interviewed, Federation cadres worked in salaried positions and moved from place to place, often managing their own difficult family situations occasioned by long absences from home. Like village women, they speak of the past in terms that highlight their commitment and hard work. They redeem in memory an enterprise-establishing collectivization in general and expanding women's role in particular-that framed their adult lives but is now regarded with public skepticism or indifference. In the early years of socialism, directives from a faraway national state authority, such as "Collectivize!" or "Don't treat marriage as a commercial transaction!" or "Give up sideline activities [such as weaving] and work for the collective!" were transmitted by a variety of Party-state actors, landing in myriad social environments and producing multiple effects. The state effect, with its rearrangements of space and recalibrations of time, was worked out through local relationships and practices and held in place by local understandings. The terms that come so easily to historians-"the rural," "the revolution," the names of individual government campaigns-are order-making devices imposed on an intractably varied landscape. Rather than presenting four distinct local studies, subsequent chapters draw material from all the villages where we interviewed, but the stories in each chapter retain the specifics of local geographies, relationships, and gendered work, reminding us that 1950s China was not a homogeneous place. Historians do not write under conditions of our own choosing. When the time is long ago and the subjects are dead, we rely on written records and material artifacts. When a possibility exists of talking to those who witnessed or participated in past events, the project of "making the invisible visible" by simply asking and recording is seductive, but chimerical. Oral and written sources are both fragmented; neither is wholly reliable. Both are essential to this project, not because combining them offers a definitive account of the past, but because each type of source bears different traces of the circumstances under which it was generated. Different types of sources talk back to, ignore, or interrupt one another, and awareness of this is crucial to the crafting of a good-enough story that does not smooth over such dissonances. The archival record on 1950s rural Shaanxi is seemingly wide and deep, but it is sobering to see how little it helps with the questions that concern us. Published sources on the collective period-government announcements, press reports, and late twentieth-century compendia of local history known (like their historical predecessors) as gazetteers-offer much detail about the timing and content of state initiatives. They are most useful when we know something about how they were compiled. Talking to Women's Federation officials, for example, helped us understand how tales of the heroic deeds of labor models were developed for publication, with the assistance of Federation cadres who resided in villages for long stretches of time in the 1950s. In using village, county, and provincial archives, we paid close attention to the classification and ordering of preserved materials: directives, exhortations, demands for reports, and stacks of internal memos. In the Shaanxi Provincial Archives, what the documents do most clearly is trace particular circuits of governmental activity. Chronology is one principle of organization here, but it is trumped by hierarchy. If the subject is directives issued by government agencies about the Marriage Law, for instance, one is apt to find all central government documents at the beginning, then regional government documents, then provincial, county, and so forth. The archives offer a clearer sense of the communications each government level generated than of what transpired when a communiqué hit the ground. As with all archives, any sense of interaction between the levels has to be assembled outside the logic of the file. State classifications fragment the subjects they aim to govern, sometimes obscuring the workings of the Party-state itself. The Civil Administration Bureau was concerned with, among other things, the Marriage Law, but there is no discussion in the Bureau's files of the literacy classes conducted at the same time. No matter that literacy classes and the Marriage Law were, in combination, two of the most important institutions affecting the lives of young rural women in the early 1950s, and that the ability to read helped make awareness of the law possible. The Agriculture Bureau was in charge of the technical aspects of agriculture, so in its thousands of pages of documents about the Great Leap Forward one can learn how many tons of fertilizer were applied to each mu of cotton-growing land in every county. But there is nary a word about the communal dining halls, even though every farmer in the province was supposed to be eating in one at the time. No sustained account of social life emerges here, just a series of governmental prisms through which human activity is refracted. Although the same might be said of all archives, the absence is particularly surprising given the Party-state's explicit goals of creating and addressing new social subjects, such as peasants and women, and transforming the entirety of rural social and economic life through collectivization. The fragmenting of social life into bureaucratic records becomes particularly striking when researching the three grim years that followed the Great Leap Forward. The desperation of China's farmers at that time has been well documented; the figure most commonly heard is that 30 million farmers died of hunger. Although by all accounts Shaanxi was not one of the provinces most devastated, the Civil Administration files from the years 1960-62 overflow with frantic activity occasioned by drought, flooding, and insect pests. The quality of the paper on which these documents were written underscores the content: the smooth cream-colored stationery inscribed with the name of each government agency has been replaced by gray sheeting similar to that used for egg cartons. Most striking, however, is the lack of connection between the urgent distress that emerges from these pages and the upbeat accounts of meetings of cotton producers recorded in the contemporaneous files of the Agriculture Bureau. Scholars have explored at length the disconnect between central government decisions and local realities in this period. Here it appears that lateral in-state communications, even those required to provide relief, may have been ruptured as well, or at least not captured by Party-state archivists. The historian who enters the archive with questions about rural women will be made acutely aware of how Party-state agendas differ from her own. Oral narratives are the only accounts we have for many aspects of early rural socialism in China, and this book would not be possible without them. Just as we ask about the circumstances that gave rise to archival materials, we need to note the context in which these narratives were heard and collected. Among many contextual factors, my status as a foreigner should not be forgotten. "It builds humility as well as impatience to contemplate what it took to get me here," reads the first line of my first fieldnote entry in August 1996. Prior to my arrival, Gao Xiaoxian and I would discuss the kind of place that we would like to visit: a place with a labor model, a place where women had played a prominent role in cotton growing or weaving, a place far from any urban center. Drawing on her intricate knowledge of rural Shaanxi, she would contact her counterparts in a district or county Women's Federation branch, and settle on a village in discussion with them. The local Women's Federation officials would then obtain approval from the county government, a process that usually went smoothly but could be derailed by unexpected concerns. During the summer of 1997, for instance, several counties were reluctant to host us because Hong Kong was being "returned to the ancestral nation," and local officials far from Hong Kong were unsure whether a foreigner's presence was appropriate at this moment of national celebration. We never went from Xi'an directly to a village. We always passed through the district capital or the county seat (sometimes both), stopping to call on and be hosted by local officials, and picking up a Women's Federation cadre or two to accompany us to our introduction into the village. I came to think of this process as a cumulative accretion of legitimacy, so that by the time a carful of us arrived in a village, all the relevant people knew why we were there and what degree of responsibility they had for us. Our arrival in a village was always put to local use. In Village T, the Women's Federation spent three hundred yuan to repair a rain-damaged road the day before our arrival. In Village B, the village leadership welcomed us, partly because they regarded their resident labor model as an uncontroversial icon of local pride. They mobilized the residents to haul away a huge pile of garbage in honor of my arrival. They were exquisitely attuned to the pragmatic advantages of having the first-ever foreigner reside in their village for a few weeks. Wouldn't it be a good idea, they asked the county transportation department, to repair the road leading to the village before the foreigner had to ride on it? When we stopped for lunch with various officials in the county seat on our way to the village, I watched a woman from the county Women's Federation skillfully importune the county foreign affairs officer to make sure the electricity stayed on in the village during my stay. The officer promised to phone the generating plant and explain the "special circumstance" to them. Since the temperature averaged 100 degrees Fahrenheit during our stay, and the continuous power allowed everyone in the village to run their electric fans, I felt marginally useful. The ease with which people greeted and talked to us was a product of Gao Xiaoxian's standing in the Women's Federation, her many years of work in rural areas, and the fact that our arrival had received official permission. Contrary to the romance of the unscripted encounter that pervades much writing about China, had I shown up alone, or had Gao Xiaoxian escorted me without advance notice or approval, it is likely that people would have been more guarded about talking to us. In our rural interviews, we usually talked to women alone, occasionally in pairs or small groups. Interested neighbors, mainly children, sometimes loitered in the vicinity, more to get a look at me than to listen to the proceedings, but this curiosity abated within a day or so. I seldom led the questioning, although I intervened actively, conferred with Gao Xiaoxian during and between interviews, and spent most evenings walking with her while we puzzled over the day's conversations. At the beginning of an interview, it was not just my limited dialect competence that made me hang back. We wanted the old women with whom we spoke to be comfortable, and it seemed more prudent (although I was there in plain sight and far from silent) not to remind them incessantly how unprecedented the occasion was. Usually, after an hour or so, my foreign face seemed not to matter anymore. So I never forgot that I was a foreigner heavily dependent on my collaborator and on a host of others: local officials; a series of note takers recruited by Gao Xiaoxian from among her co-workers in Xian (including, on one trip, her oldest daughter), who wrote while we talked and taped and spent hours going over each interview with me soon after it occurred; the village women's cadres who located families with whom we could stay and who found women to cook for us; local transcribers, who patiently invented written renderings for oral dialect expressions, producing handwritten Chinese transcripts that often ran into the hundreds of pages. (Chinese word processing only became available several years into our project.) Written transcripts, however faithful, are not the same as oral narrations; they cannot convey subtleties of tone or pacing that are obvious in person and at least partly preserved on tape. Yet without these transcripts I would be far less sure that I had understood the four varieties of Shaanxi dialect we encountered in four different villages. Interviewing in Shaanxi permanently rendered hilarious, at least for me, the idea that an outside researcher is ever a fly on the wall, or an omnicompetent investigator who can handle all aspects of the research herself. The stories retold in this book cannot be separated from the messy, complicating circumstances of their collection, or from the supporting apparatus that allowed me to learn what I did. Examining the features of my dependence and enmeshment, rather than trying to ignore them, has been a bracing and necessary exercise. The brouhaha that attended our arrival in each village never lasted long. Local officials had other matters to attend to, and none of them was interested in the protracted stories told by old women we had come to hear. Occasional eruptions of official activity punctuated our village stays. In Village T, a crew from the county television station swooped in one morning to film an interview, accompanied by several layers of officials, for a total of twenty-one people. But we were generally left alone. In Village Z, county officials couldn't have visited us even if they wanted to; the road from the county seat, forty-four kilometers away, washed out in a rainstorm after our arrival. Villages are not the preferred place to linger for officials from what the local farmers refer to simply as "above." No one in an official position sat in on our interviews, directed us to particular interview subjects unless we asked, told older women what to say, or kept track of what they said. Our interlocutors were not shy in their willingness to be critical of state policies, past and present. Nor were they reluctant to provide long accounts of conflicts with family members, neighbors, and officials. We benefited from the oft-noted phenomenon that people choose to say things to an outsider they would not say to their next-door neighbor, because the outsider, a transient, will not reveal their secrets locally. Many people understood speaking "for the record" as an important activity. All of them gave every indication that they took these conversations seriously. This book walks the methodological border between history and anthropology, posing various ethical and practical dilemmas for the author. Historians aim to reveal their sources and establish the unique circumstances of their subjects by fixing them in time and place. Many historians feel a particular obligation to restore the erasure of nonelite women from the historical record, although here the question of who "gives voice" to whom is a complicated one. Anthropologists, in contrast, protect the anonymity of their sources and establish both the unique circumstances and the shared cultural assumptions of their subjects through ethnographic description rather than straightforward naming. To this difference in disciplinary practices one must add the uncertainties of conducting fieldwork in rural China, where official approval at one moment (or by one level of authorities) can be succeeded by jittery accusations the next. To name women and their communities, or not to name? We were given permission by the women we interviewed to use their words and their names in print, but here is where an uncertainty comes in: could they know what they were consenting to? We were left trying to assess whether the publication and rapidly evolving circuits along which stories travel might boomerang in a way that could bring community distress, political trouble, or personal pain to them or to their relatives. We also wanted to honor their accounts of their own achievements. And we wanted to recognize the desire of communities with former labor heroines or activists to deploy the meager social capital that remained from those deeds, making a public claim for the value of their own lives. After many years of discussion, we have decided to disguise the names of villages by using initials, and to use pseudonyms except in the case of women who were public figures, such as the labor models Cao Zhuxiang, Shan Xiuzhen, and Zhang Qiuxiang. Cao Zhuxiang was regionally famous and Zhang Qiuxiang nationally known; numerous published and archival documents, some cited in this book, attest to their fame, and their interviews supplement and enrich the written record in ways that should not prove problematic for them or their communities. Nevertheless, I have sometimes changed or avoided a name in one of their tales if I thought the particular content of the story might bring distress to them or their relatives. Oral narratives are social as well as individual products. Information about us circulated incessantly through the villages in which we interviewed, earlier interviewees gave later ones free advice about what might interest us, later interviewees complained that they had been misrepresented by earlier ones, and so forth. Our interviews were influenced in specific ways by my obvious foreignness, as well as Gao Xiaoxian's status as an urban woman who works for a government-sponsored "mass" organization, and we paid a great deal of attention to interchanges where this was a factor. What was most important to many interviewees, however, was the chance to talk to someone interested in their long-neglected stories. Before we began our first interview trip, Gao Xiaoxian and I made lists, separately and together, of things we wanted to know. Because we wanted to understand what events each woman regarded as important, we did not provide many cues at the beginning of an interview. We would explain our project briefly, ask each woman for an account of her own life, and follow up on whatever she said initially. Some women produced standard stories of pre-Liberation bitterness and post-Liberation happiness. Others rambled incoherently, and it was not always clear whether the problem was related to age, fatigue, nervousness about the interview, or our failure to explain ourselves adequately. In still other cases, a woman would sit down and launch into a detailed, passionate, and uninterruptible account of something that was bothering her, which might not have an obvious connection to the 1950s: bad treatment by an adult son, the death of a child several years previously, a Cultural Revolution-era humiliation, a 1980s business deal gone sour. Even when a woman's story about the 1950s was clear and concrete, she often punctuated it with an ongoing commentary about her life of hard work and suffering, producing a skein of statements linking the 1950s to subsequent periods and ultimately to present concerns. We usually followed the narrative wherever the teller wanted to take it, while also attempting to broaden our questions about the 1950s to elicit the richest account possible. On occasion we found ourselves wondering if by not imposing categories we were, in fact, imposing a very large categorical requirement: asking women to create a narrative structure out of their lives when they were not in the habit of doing so. Since Gao Xiaoxian is also an outsider, albeit of a different order, we have also both benefited from the triangulation of our different perspectives with the villages we visited. The questions we asked changed constantly as we talked and argued about what we were learning and how we were structuring conversations. This meant that no two interviews had the same structure, although they had many points of comparability. Where excerpts of the interviews are included in this book, I have been faithful to the original content, but have sometimes rearranged or edited an excerpt in order to eliminate repetition and increase readability. I am aware that something of the recursive and emotion-laden nature of oral narratives, as well as the pacing, emphasis, and tonality of a story, are lost in the move to written form. Conveying the intensity and tenor of an interview, absent the somatic and dramatic presence of the teller, requires attention to how something reads as well as how it once sounded. Memory is not the repository of the "true"; as the French historian Jacques Le Goff suggests, it involves not just the establishment of traces but the rereading of those traces. Memory appears to be created anew whenever it is called upon, as the teller actively creates new meanings. It entails constantly rearranging one's understanding of what one remembers in such a way that the coloring of the memory may shift. Every telling enacts a loss, because as memory is restarted and resituated, it moves further away from the sensuous experience and the teller's earlier understanding of an event. But at the same time, every memory is also a creation-not necessarily a whole-cloth invention (although there are also those), but a product of the confluence of past events and present circumstances. As Alessandro Portelli writes, for historians the helpfulness of oral narratives is "not so much in their ability to preserve the past, as in the very changes wrought by memory. These changes reveal the narrators' effort to make sense of the past and to give a form to their lives." What people remember is the product of a continual process of reworking, recitation, invention, and sometimes carefully guarded silences that help shape what is said. Women may remember a particular aspect of self only in the process of answering our questions or of choosing what and what not to say to us. Conversely, they may neglect to include something central to their lives because we did not know enough to ask. Several days after a long informative interview with a woman in Village G about her divorce in the 1950s, we learned that she and many of her friends had been enthusiastic opera performers during the same period. When we called a group of them together and asked her why she had not mentioned opera to us earlier, she replied, I didn't tell you anything you didn't ask me about. Deeply held as a speaker's interpretations might be, carefully crafted as they may be, they are still produced at a specific moment, for particular listeners. Every time a woman responded to our questions, or ignored them and instead told us something we didn't know enough to ask about, she was creating her story in response to us, but also simultaneously with her family and neighbors, living and dead. It was often an opportunity to exhume old grievances, rehearse new ones, conclude unfinished business, or salve injuries past and present. We preserve memories of each epoch in our lives and these are continually reproduced; through them, as by a continual relationship, a sense of our identity is perpetuated. But precisely because these memories are repetitions, because they are successively engaged in very different systems of notions, at different periods in our lives, they have lost the form and the appearance they once had. They are not intact vertebra of fossil animals which would in themselves permit reconstruction of the entities of which they were once a part. One should rather compare them to those stones one finds fitted in certain Roman houses, which have been used as materials in very ancient buildings; their antiquity cannot be established by their form or their appearance but only by the fact that they still show the effaced vestiges of old characters. This book attends both to the "effaced vestiges" and to the new edifices they now support. It is shaped by tensions between narrative orderings of time and memory on the one hand, and habits of historical ordering on the other. Rather than despair at narrative inconsistencies in stories of the 1950s, it asks what we might learn from them. Luise White reconfigures the question of narrative "mistakes" in describing the circulation of vampire stories in twentieth-century Africa: "The inaccuracies in these stories make them exceptionally reliable historical sources as well: they offer historians a way to see the world the way the storytellers did, as a world of vulnerability and unreasonable relationships." Oral narratives, then, are called forth under particular circumstances, unevenly recorded, selectively remembered, and artfully deployed by our village interlocutors as indirect commentary on a troubled present. Oral narratives told in the present about the past need to be valued as a history of the present precisely for the ways they slip older moorings of meaning and relodge to engage with new situations. The challenge is not to fix meaning and interpretation, but to keep track of what accounts for changing meanings and interpretations. And it is important to be aware of the ways oral narratives by old village women talk back to or talk past big state projects like rural socialism, while also managing to destabilize big feminist recuperation projects like the one in which I came of age as a historian: "making the invisible visible" by paying attention to the lives of women. This book pays attention to oral narratives in the light of the written record, and vice versa. It reads narratives from one person in the light of another, narratives from one community in the light of another, and women's narratives in the light of those of the much smaller number of surviving men. Such a project presents more than the usual share of organizational conundrums. It requires keeping track of state and individual temporalities, without assuming that they are utterly discrete realms. It demands attention to opacity and lack of affect as well as to gripping tales, concern for lies and silences as well as for passionate truth claims. Above all, it compels respect for limits and dead ends-reluctant recognition that women's voices offer no direct line to hidden histories, that oral narratives are as contaminated as any other retrievable fragment of the past. It requires cultivating an interest in and respect for that contamination. And it extracts, finally, an admission of my own historical stakes as listener, writer, and teacher: I want these stories to matter, to stick with the reader, to make Big History look and feel different. People who work with oral narratives sometimes distinguish between using them to get at specific information and using them to pay attention to narrative structure, elisions, silences, opacity, and lies-in essence, doing a close reading. This book does both. Mining these interviews for information, I look for common themes repeated by women who have never met one another. I am also caught up in individual moments of storytelling beauty and pain and clarity. The chapters that follow pay attention to confusion and discomfort (theirs and ours), and also to instances when a woman told us things we had not asked about and did not think we needed to know. Does memory have a gender? If so, what does it look like and sound like? How do we know that the stories we heard, the judgment of what counts as an event and is worth remembering and telling, were inflected by the gender of the narrator rather than by rural residence, personal circumstance, or a host of other factors? What can memories tell us about gender as an axis of power, difference, attachment, grievance, and collectivity in 1950s rural China? Memory may not have a gender; such a formulation posits gender as immutable, rather than as a constantly shifting set of social and symbolic relationships. But memory is a social process, shaped by the social distinction of gender in ways impossible to ignore. In talking about the 1950s, women remembered a set of events that overlapped but did not duplicate those remembered by men. This is not surprising. State policies targeted women in specific ways. The ever-changing division of labor, affected by state initiatives as well as local expectations, continued to differentiate between tasks appropriate to men and those appropriate to women. The daily lives of girls and women did not look like those of boys and men, even within the same household. Without keeping gender constantly in view, we miss the ways women's labor, both acknowledged and invisible, shaped the course of socialist construction under Mao. The stories we heard from women reflected a more distant relationship than that of men to the campaign time of the state. In women's accounts of their lives, recalled in interviews more than forty years later, campaign time was variously reproduced or altered, appropriated or overturned, ignored or amplified. Of course, not all women remembered in the same way; individual and community variations were important, as was their degree of political involvement. But where men would recite to us a series of political changes more or less in textbook order, women were far more likely to scramble calendar years and reorder or rename events. Such rearrangements should be understood not as errors, but rather as interpretations of the gendered past. The most obvious temporal divide provided in state language was that of "before Liberation" (jiefang qian) and "after Liberation" (jiefang hou). Women were mobilized during the land reform of the late 1940s and early 1950s to "speak bitterness," narrating and interpreting the hardships they had experienced as children and young adults. They were also organized to participate in literacy classes and mutual aid teams. Through these novel practices they were encouraged to arrange their memories and personal narratives into categories of pre-Liberation suffering and post-Liberation opportunity. The use of the term "Liberation" for the change of state authority in 1949, which quickly became part of the daily vocabulary in rural China, itself encoded a particular understanding of events. Citing Liberation as a signpost in one's life meant organizing one's own memories into a personal and collective narrative of emancipatory progress. Like all hegemonic vocabularies, however, this one was subject to being wrenched out of its intended context and deployed in ways that would mock the intentions of state officials, even if unintentionally. In official state terms, for instance, "the old society" refers to any time before the People's Republic was established in 1949, and Liberation signals the advent of "the new society." Some women used the phrase "the old society" to refer to the 1940s, as per state language. But others said that the old society had lasted until the end of the Great Leap famine, in about 1963, encompassing the entire period we were trying to investigate. A Chinese researcher interviewing village women in another community found that some of them used the term "the old society" to refer not to the period before 1949, but rather to life prior to the economic reforms of the early 1980s. In doing so they reworked a common official description of "speaking bitterness": "recalling the bitter [of the prerevolutionary past] while savoring the sweet [of the collective period]." In contrast, women invoked "the old society" by lamenting the difficult circumstances of the collective years compared to the more abundant reform-era present. This slippage is especially interesting because the meaning of the term "the old society" was firmly fixed for more than three decades before the reforms began. It is unlikely that interviewees simply forgot what the term commonly meant. Their recombination of chronology and event is a clue to their interpretation of their own past, couched in a twisting of official terminology. It encodes an unsubtle critique of the collective period, since the valence of the term "the old society" remains-as it was intended to be in official parlance-utterly negative. Here the language of the state is turned against the state by a "misremembering" of state temporality-one far more common among the women we interviewed than among the men. In rural areas, campaign time centered on the reorganization of agricultural production into progressively larger collectives. The main signposts were land reform, mutual aid groups, unified purchase and sale of grain, lower producers' cooperatives, advanced producers' cooperatives, the Great Leap Forward, and the three years of catastrophe (not a campaign, but a recognizable event). These campaigns meant profound changes in daily life for both women and men, but whereas most men narrate their memories by campaign, and women labor models do so in part, ordinary women organize the stories of their past rather differently. They may recognize the names, but rearrange the order or rework the elements. This in itself often suggests what they remember as important. For instance, all the women we interviewed understood the term "Great Leap Forward," but none of them used it in describing their own histories. They did not see the Great Leap as a unified national phenomenon; their version of local campaign time disaggregated it into constituent elements that had meaning for them. They talked about "the time when we smelted steel" or "the time when we ate in collective dining halls"-a policy measure in which people smashed their kitchen stoves, melted down their pots for steel, and ate in public dining halls, when a day's work was required for a day's food, and a few months of glorious eating were succeeded by several years of government-induced famine. The disaggregation suggests that although national policy had profound effects on rural life, what was remembered-or forgotten-was determined not by reference to national development goals, but by the changes wrought in domestic arrangements and the gendered apportioning of tasks. Similarly women in Village G referred in a locally specific way to the famine that followed the Great Leap. In national chronology, the famine is usually called "the three years of difficulty" or "the three years of disaster," but in Village G, people called it "the years of low standard when squash and vegetables were substituted." This was a version of a phrase in a November 1960 emergency government directive-gua cai dai, di biaozhun-calling on people to eat squash and other vegetables to deal with the shortage of staple grain, a clear regimen of deprivation. (In many areas of China, as one historian notes, the squash and vegetables were long gone by that time, and many people were eating leaves, bark, wild vegetables, and white clay.) Here too, in their choice of language and matter-of-fact tone, women disaggregated the campaign and the famine into concrete elements that affected their daily lives. State language had given people a powerful new vocabulary with which to narrate their pasts. In each of these cases, women refashioned that vocabulary. Gender does not explain all of these slippages and modes of rearrangement. (A common story told by youth "sent down" to rural locales during the Cultural Revolution is that when old peasants were organized to tell past stories of bitter suffering to the new arrivals, they horrified village leaders by talking about the Great Leap famine rather than the 1940s.) But the milestones of campaign time figure much more prominently in the stories of men than in those of women. Most of the men we interviewed had once held positions of village responsibility, as accountants or bookkeepers or team heads. They code-switch more easily, speak of children less frequently, remember more completely the campaign time of political life-perhaps because they participated in it more fully. The lives of most women have intersected with state projects differently from those of men, and the women seem to have absorbed state language less completely, appropriating and reworking it in distinct ways. In a very literal sense, in their personal narratives rural women name a different temporality from that of rural men. A history of the 1950s written beyond the frame of campaign time will need to take account of the terminology and the massive changes that campaign time wrought. But it must also ask what rural women are practiced in remembering, and what they have learned to forget. State temporality coexisted with other ways of understanding time. Marital temporality divided the lives of women between early years in their natal village and life in a new community as a married-in bride. Women recalled some major events by the months of the lunar calendar. Child rearing and the particular demands it entailed were also a major marker of memory. Clearly campaign time helps to organize women's memories of the collective era, but it does not encompass them entirely. In one community, as chapter 9 details, women initially appeared to have forgotten the final two decades of collectivization-a pattern of memory I call "a wrinkle in time." It is probably necessary, if uncomfortable to sequence-minded historians, to think in terms of multiple temporalities, overlapping and jumbled, inflected in crosscutting ways by gender, marriage, level of political activism, and age. Are silences, elisions of time, and eruptive memories the aftermath of trauma? Of depoliticization? Are they the traces of exhaustion and preoccupation with daily labor? Women engaged in a memory practice that we did not hear from men: marking time by the birth years of their children, ordered by the twelve-year cycle of the Chinese zodiac (year of the rat, year of the ox, etc.). After a decade listening to women precisely name the animal of each child's birth year, while scrambling or forgetting the events of collectivization, in 2006 we asked three women in Village B to organize major events by chronology according to zodiac signs. We provided drawings of the zodiac animals, with calendar years written on the side, and asked them once more to describe events they had told us about over the years. Some events were national in scope, such as the establishment of cooperatives. Some were local, such as the time a jealous saboteur put salt in the bean curd he was selling and tried to discredit Cao Zhuxiang by telling everyone that the inedible stuff was produced by her co-op. As we called out the name of each event, each woman keyed the events to the births of her own children. A series of "I can't remember when" replies was transformed into assured chronology-making when we provided the zodiac animals. There is nothing "natural" about this divergence in memory and language, this propensity to remember history according to children's birth years. To begin with, we provided the drawings of zodiac animals. Gao Xiaoxian comments that as with so much else about our interviews, "if we had not asked about it, I am not sure if they would have used this method themselves. They would not have been able to talk clearly about their sense of time. We used that to help them fit their stories into various moments." Still, we chose to provide the animals precisely because many prior years of interviewing had taught us that women spoke with great confidence when asked about the year of a child's birth, whereas inquiries about calendar years drew a blank response from all but the most active cadres. This divergence reflects the differential ways in which "male" and "female" were understood, and the uneven degree to which their normative tasks, including those associated with children, were addressed by state policy and local assumptions. Women had specific ways of describing their past actions. Sometimes they drew on recent images of revolutionary heroism. Many told us stories of profound transformation in many aspects of village life. Encouraged by the Marriage Law campaigns of the early 1950s, some of them broke off parentally arranged engagements or ended marriages; others asserted their own preferences in choosing a husband. They learned to read in winter literacy classes, were trained as new-style midwives, or took on responsibility as women's cadres. All of them participated in the process of collectivization, the enthusiasms and hardships of the Great Leap Forward, and years of field labor with other women, in some cases becoming labor models. Their lives as young adults, in short, were marked in measurable daily ways by Party-state initiatives. They felt themselves to be different from and more fortunate than their mothers, and many of them contrasted their ability to move through public space in the 1950s with childhoods that were more spatially and materially constrained. Nevertheless the dramatic rupture at the heart of "speak bitterness" stories is absent from the accounts of these women. Instead they spoke in perduring self-characterizations, in statements of stable identity that spanned the 1949 divide and the recent reform era as well: I was never feudal; I was always capable; I worked for family harmony; I was a person of principle; I have always been kindhearted. Or, in a less optimistic register: My life was bitter and pitiful in the collective period and the present as well as the pre-Liberation past. The recurring themes in these stories draw on prerevolutionary notions of female virtue, reworked and intertwined with more recent categories of self provided by the revolution. Several of the qualities the women emphasized-industriousness, competence, the ability to manage human relationships deftly-drew on culturally durable notions of "the good woman," even though the physical and social locations of these virtues were no longer confined to the household and might indeed be performed in the service of the collective. The quality of being pitiful, although not virtuous in itself, was a recognized characteristic of the oppressed classes, and thus it can be said to ally one with revolutionary virtue. In these women's stories, however, being pitiful indicates something else as well: an oblique criticism of both the Party-state and the family for failing to recognize the virtuous sacrifices of the storytellers. I cannot know whether interviews conducted in 1955 (or 1975 or 1930) would have turned up the same vocabulary of virtue among women. I cannot track what they might have said about themselves at other times and compare it to the vocabulary of newspapers or policy directives or the varying intensities of campaign language. Because rural women generally left no written records, and time travel is not in the historian's toolbox, I know much less than I would like about the temporality of the vocabulary in question, across the putative boundary of 1949 or even across the history of the People's Republic. Whether virtue has recently made a comeback under the trying circumstances of the reforms or has been there all along, and if so, with what variations of nuance, are all troubling and undecidable questions. Perhaps women's narratives drifted so easily away from orthodox state usage because revolutionary language of the collective period, rich as it was on the topic of what women should be and do, had very little to say about crucial areas of women's daily lives. For all the years of the collective era, women were exhorted to go out and work in the fields, to contribute to socialist construction. Over time they found themselves compelled to do so in order to earn enough work points to feed their growing families. At home, they were told to promote harmonious family relations. But domestic work, except for the brief and disastrous dining hall experiment, was firmly located at home, mentioned only occasionally in state documents as a remnant destined to disappear in the indefinitely receding Communist future. Women may not remember the order of collectivization in the 1950s and beyond, but they recall very clearly staying up most of the night, working by faint lamplight in the years before electricity arrived in the early 1970s, to make the cloth and clothing and shoes their families needed. The state's success in lowering infant mortality, combined with its infrequent attention to birth planning before the 1970s, contributed to the rising number of children in those families and the general exhaustion of their mothers. The labor of clothing them happened on domestic time, which had no public language in rural revolutionary China. When women recalled these activities, state vocabulary was of no help, and mere description of domestic tasks was inadequate to the new and challenging environment in which those tasks were now performed. Perhaps it is not surprising, then, that women reached for an older language of performance under duress, the language of womanly virtue available from several millennia of popular tales in local histories, operas, and stories from classical texts, circulating in village performances and (more recently) on television and video. Crafting narratives of the self in the collective era-what sorts of people they had been, how they had treated others, how others had treated them-they spoke often about what it meant to be a good woman and to deal properly with family members as a good daughter, daughter-in-law, wife, mother. The virtues they named most often-industriousness, attention to harmonious social relations, and competence-were compatible with behavior expected of a woman cadre or a labor model. But less politically active women incorporated these virtues into their self-descriptions as well. In reaching for a story, and a language in which to tell it, women defined themselves by narrating virtues quite distinct from those available to men. Such virtues were an undercurrent even in anecdotes in which women performed heroic revolutionary actions: fearlessly striding home late at night from a political meeting, jumping into a flooded field to save the crops, winnowing grain all night long. The paradox here is that a revolutionary state language that actively sought to remake women's behavior-the language of the model woman socialist citizen-yielded so completely in these stories to a more pliable, much older language of virtue. Aging women narrate their childhood, youth, and middle years at a moment when their longevity, self-understanding, and economic vulnerability are all shaped by gender. Women born between the 1910s and the 1930s in central and southern Shaanxi have absorbed and sometimes benefited from more than one set of cataclysmic changes. Their stories highlight what they feel to be their enduring virtues, their important achievements, and their most deeply harbored grievances across decades of political transformation. They came of age in a time of serious chaos, and their stories of childhood are populated with the physical and sexual menace of bandits and soldiers (not always distinguishable) and punctuated with episodes of flight from famine or from human marauders. They lived a substantial part of their adult working lives in collectives of various sizes, and their accounts of that period encompass a range of story lines: individual accomplishment, periodic organizational chaos and community dissatisfaction, and the numbing domestic chores of feeding and clothing burgeoning families. In the early twenty-first century, a quarter-century after the economic reforms began to dismantle collective agriculture, "collective memory" is formed in the recounting of a shared time, recalled through a set of shared conventions and further refined in interaction with others. More literally, it is the memory of a life within a collective, a social formation that structured daily work, politics, and personal interactions. If recalling the collective past involves placing oneself within the perspective of the collective, then women must place themselves in relationship to a group that no longer exists, but that is nonetheless the group in which they spent their youth and much of their adult lives. The women we interviewed must assimilate a complex political history. The Nationalist regime under which they spent their childhood was thoroughly repudiated by the founders of the People's Republic of China. The PRC regime, however, was not repudiated either by the post-Mao leadership or in popular discourse, even as its promises of development and equality through collectivization began to ring hollow, even as collectivization itself has lost popular support and been reversed in the name of "market socialism." Collectivization required both dramatic efforts and demanding daily work. Now those feats are being recalled two decades after collectivization was dismantled by women who are well aware that it never delivered on its promise of economic abundance. They often recall those years as times of unremitting field work, domestic work, and childbearing. To complicate matters further, as the final chapter explores, older rural women understand themselves to have benefited from the subsequent economic reforms, yet simultaneously to have been disadvantaged by them. Although they seldom express direct dissatisfaction with state policy, women describe themselves as virtuous and capable in meeting the demands of both state and family, while coping with lack of support and attention from both quarters. The construction of a remembered self in commonly understood terms of virtue, and the assertion that the speaker was constant in her virtue no matter what the circumstances, create a contrast with broader political change, which is variously implied to have been too quick, too thorough, not quick enough, or insufficiently thorough. Although women characterize the present economic reform era as a time of far less privation and labor than the collective past, their stories of that past are also suffused with pride in their previous capabilities, now diminished, and resentment at sons and daughters-in-law who do not understand, value, or offer reciprocity for their past sacrifices. Present circumstances of uncertain support, emotional betrayal, and in some cases outright elder abuse invariably shape their memories and the telling of them to sympathetic outsiders. Their memories may be ephemeral, destined to disappear soon, resonating differently each time they are told in a present that no longer recognizes their salience. In the face of that massive indifference, the stories of aging rural women spoken in the present become a form of backtalk, a defiant assertion of gendered memory. This returns us to the question of whether Chinese women, and rural women in particular, had a revolution. Yes, in the sense that space and time, as they lived and understood them, were profoundly reordered in the 1950s. The revolution they had, however, was shaped in particular ways by gender, understood not as an immutable property of humans, but as an ensemble of practices that were differentially addressed-and neglected-by revolutionary policies. This material requires attention to all its messages: all the ways that female virtue, performed in the service of the revolution, also provides a critique of that revolution and its progeny. Gendered memories are crucial to a good-enough story of the recent Chinese past. What can we learn about the Chinese revolution by placing a doubly marginalized group—rural women—at the center of the inquiry? In this book, Gail Hershatter explores changes in the lives of seventy-two elderly women in rural Shaanxi province during the revolutionary decades of the 1950s and 1960s. Interweaving these women’s life histories with insightful analysis, Hershatter shows how Party-state policy became local and personal, and how it affected women’s agricultural work, domestic routines, activism, marriage, childbirth, and parenting—even their notions of virtue and respectability. The women narrate their pasts from the vantage point of the present and highlight their enduring virtues, important achievements, and most deeply harbored grievances. 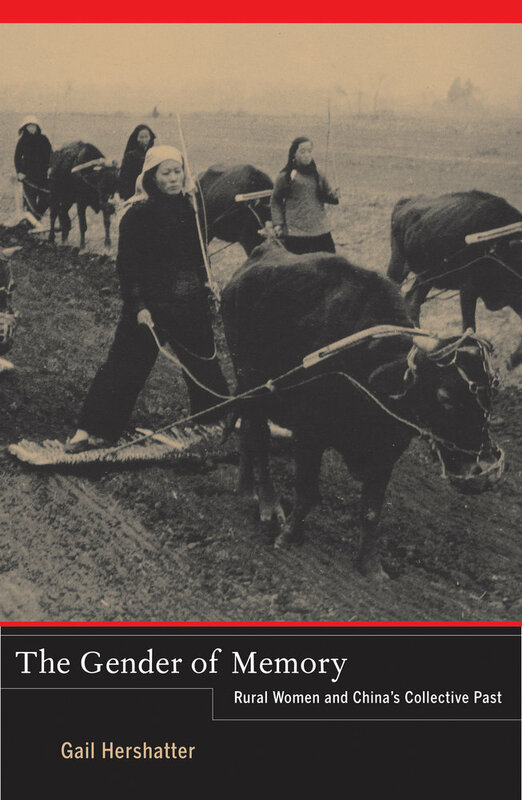 In showing what memories can tell us about gender as an axis of power, difference, and collectivity in 1950s rural China and the present, Hershatter powerfully examines the nature of socialism and how gender figured in its creation. Gail Hershatter is Professor of History at the University of California, Santa Cruz. She is the author of many books, including Dangerous Pleasures: Prostitution and Modernity in Twentieth-Century Shanghai and Women in China’s Long Twentieth Century, both from UC Press.